For more than 150 years, Sherwin-Williams has been providing innovative coatings solutions to interior designers, painting contractors and homeowners alike. Today, Sherwin-Williams offers a vast array of interior and exterior products that meet the highest standards for durability, dependability and aesthetics. In addition, Sherwin-Williams offers legendary color and design services and innovative color tools to help bring your vision to life. 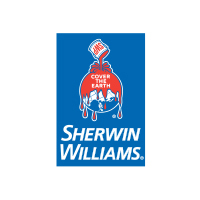 Plus, with over 4,300 company-owned stores and 2,700 experienced representatives, you can be sure that with Sherwin-Williams, expert advice is always right around the corner.